Several veteran wrestlers seem to have found the proverbial fountain of youth in 2016. Some have reinvented themselves, others have changed promotions, and some others just keep plugging along. Here is a list of some key trading cards of some of the surprising success stories of 2016. As crazy as all of that may sound, “Broken” Matt Hardy became one of the most talked about characters in all of wrestling. 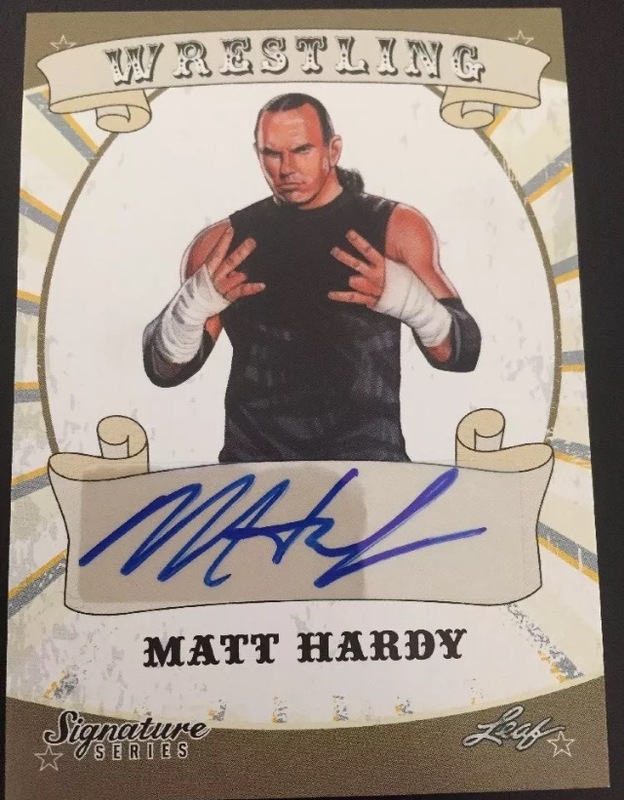 Hardy has appeared in dozens of trading card sets from companies like Leaf, Topps, Fleer, TRISTAR, and more. His earliest trading card was included in the March 1998 issue of WWF Magazine, which shows a very young Matt and Jeff getting chokeslammed by Kane; this card can usually be found on eBay for $2-3.Most recently, Matt was included in 2016 Leaf Wrestling Signature Series. His basic autographs from that set can usually be found for $10-15. Most recently, Matt was included in 2016 Leaf Wrestling Signature Series. His basic autographs from that set can usually be found for $10-15. “The Phenomenal One” has long been regarded as one of the best wrestlers in the world – especially in 2014 and 2015, during his time in New Japan Pro Wrestling. But in 2016, Styles became a star to his largest North American audience to date when he signed with WWE. Styles debuted at the Royal Rumble, main-evented WWE Network Live Event Specials against Roman Reigns and actually got the best of John Cena in their feud. Topps wasted little time in getting Styles into its WWE products. 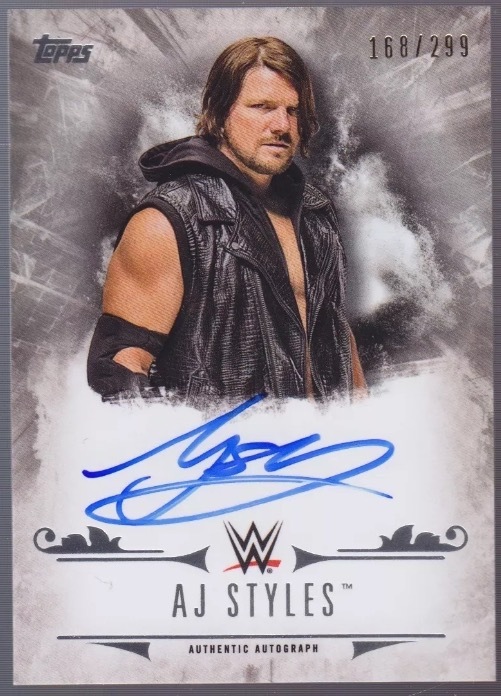 His autograph was included in 2016 Topps WWE Undisputed in July, and the basic version (serial numbered to 299) typically sells for $35-45. Collectors can find plenty of cheaper autographs and memorabilia cards of Styles from TRISTAR’s TNA line from 2008 to 2013. 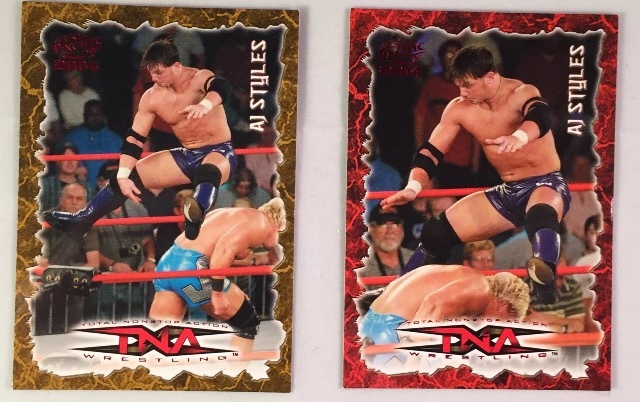 Collectors may want to keep an eye on Styles’s cards from Pacific Trading Cards’s 2004 TNA set. Styles has two basic cards that are essentially the same: card #47 (red border) and card #71 (gold border). The entire 2004 Pacific TNA set was an afterthought for years, but it turns out that set included the first cards (some label them “rookie cards”) of future top stars.Styles’ base cards from this set were basically worthless for years, but now they sell in the $5-10 range. The 2004 Pacific TNA set also included C.M. Punk’s first licensed trading card, and when he got hot during the summer of 2011, collectors were spending up to $50 get one. Styles’s base cards from this set were basically worthless for years, but now they sell in the $5-10 range. The 2004 Pacific TNA set also included C.M. Punk’s first licensed trading card, and when he got hot during the summer of 2011, collectors were spending up to $50 get one. Styles also has an autograph in the 2004 Pacific TNA set, but be careful before you spend too much money on one. For years these cards sold in the $10-20 range, and now dealers are asking in the $75-100 range, labeling it a “rookie autograph.” There is no evidence to suggest that a wrestler’s first year (or “rookie”) autograph sells any higher than any other, so don’t overpay. When Roode walked out to a thunderous ovation at NXT Takeover: Brooklyn, he had to be thinking to himself, “Where were all of you when I was wrestling in TNA?” Long-time fans saw Roode’s entire 12-year journey in TNA, from promising youngster to tag team star to world champion. Roode is almost 40 now, but he will probably emerge as a top tier player in NXT. All of Roode’s trading cards to date can be found in TRISTAR’s TNA products from 2008 to 2013. He is paired on cards in several sets with Beer Money partner James Storm, or Fourtune stablemates like A.J. Styles and Frankie Kazarian. 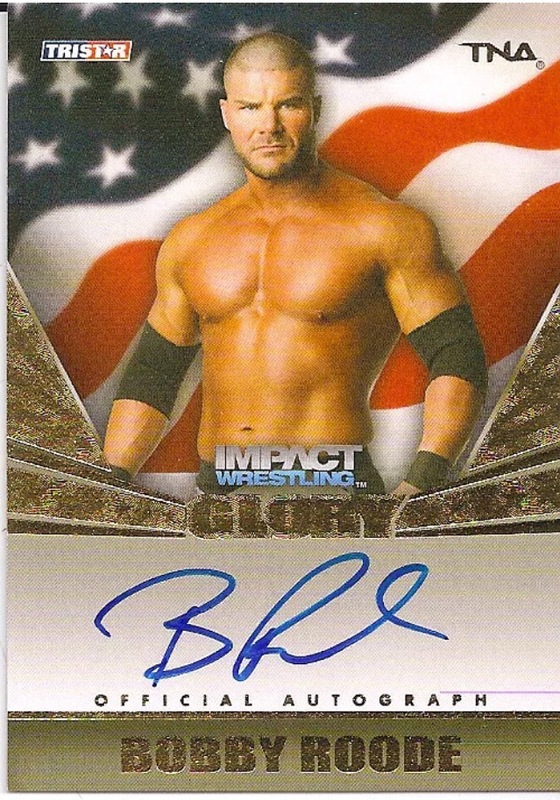 Roode’s best card is his 2013 TNA Glory autograph, which is one of the few sets that features on-card signatures instead of sticker autos. The basic version of this card is serial numbered to 199 and can usually be found for $12 or less. Aries and Kendrick took very different career paths to get where they are today. Kendrick has been in and out of WWE, TNA, ROH, and just about every other promotion since 2002. Aries, on the other hand, worked for just about every other wrestling promotion before finally signing with WWE earlier this year. Aries is cementing himself as a top star in NXT, while Kendrick became the Cinderella story and sentimental favorite in WWE’s Cruiserweight Classic. Aries and Kendrick are linked together by one very cool trading card. 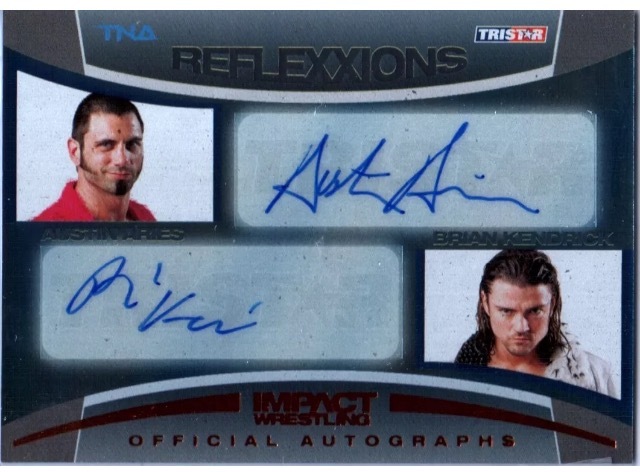 Their signatures appear together on a 2012 TRISTAR TNA Reflexxions Dual Autograph. At the time, the two men were feuding over TNA’s X Division Title. In 2016, however, the card is a reminder of two sentimental favorites who have traveled so far. The basic version of this card can usually be found for $15 or less, with serial numbered parallels selling for more. There are times when fans wonder, “How is Heath Slater still on the WWE roster?” And then there are times like Summer 2016 when Slater’s value and talent shine through. Slater’s role as the delusional jobber and the gutsy underdog who stood up to Brock Lesnar earned chants of “We Want Slater” during Summerslam weekend. 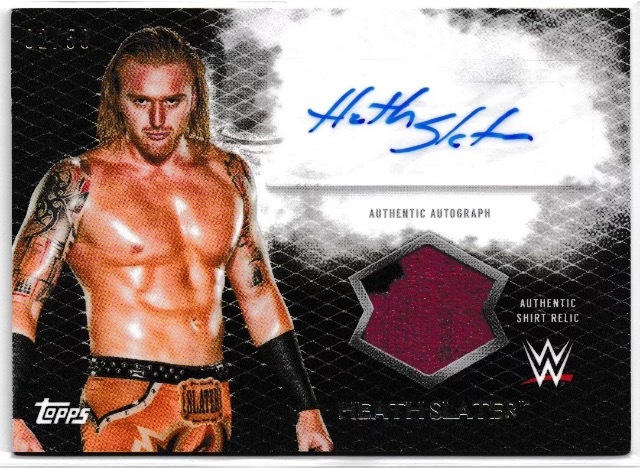 Slater, as part of the first NXT cast, first appeared in Topps’s 2010 WWE Platinum set. His best card is an autograph/relic card from 2015 Topps WWE Undisputed, which can be found for under $10. Perkins is only 31-years-old, but has been wrestling since he was a young teenager. He wrestled for ROH, TNA, and other promotions before getting a chance to shine in WWE’s Cruiserweight Classic this summer. Perkins has appeared in at least two trading card sets. He was included in the independently produced 2013 Missouri Wrestling Revival set; his card can be ordered for $1.50 at MissouriWrestlingRevival.com. He also appears as Manik (a/k/a Suicide) in the 2013 TRISTAR TNA Glory set. His Manik autograph can usually be found for $10 or less.